It’s spring again in Minneapolis, which means it’s time for homeowners to get their air conditioning systems ready for the summer. Annual air conditioning cleaning and maintenance should be performed by homeowners or a licensed service contractor. If your air conditioning system is over 20 years old, it has surpassed its designed life expectancy, which means parts will eventually fail as they are much less energy efficient and prone to leak refrigerant from general wear and tear. Also, the R-22 refrigerant used in air conditioning systems over 20 years old has been phased out by the EPA for harming the ozone layer. This has caused an extreme spike in the cost of R-22 refrigerant and is subsequently passed down to homeowners who have old air conditioning systems. 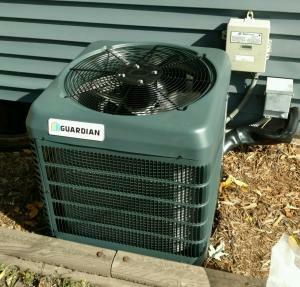 For these reasons, many homeowners are choosing to upgrade their air conditioning systems, as one of our customers in South Minneapolis, recently did. After spending nearly $1,200 on repairs to, her air conditioning system last summer she decided to upgrade her air conditioner and furnace to an Amana system that reaches a 16 Seer rating and a 97% high-efficiency furnace. Not only will she save a considerable amount on her energy bills but she also qualifies for $950 in rebates from CenterPoint Energy and Xcel Energy.